Miss Isabella is turning 1, and we celebrated with a cake smash and birthday portraits in downtown Greer SC at Greer City Park. This little “sweet one” was SO funny when she tried her cake…and she sure loves it when her daddy sings “You Are My Sunshine.” Her little face just lit up every time he would start singing to her, and it was precious. Isa’s Mommy is also celebrating a special birthday very soon, so she took some time to shine as well. This sweet family adores their baby girl, and it was a pleasure to watch them love on her. Happy 1st Birthday Isa and Happy 25th Sarai! How adorable is Isabella’s girly tutu and gorgeous eyes?? Eeek, those little bare feet and huge grin just make me smile!! Beautiful mommy and baby girl! This photo just makes me smile SO big! I love Isa’s big ol’ grin, her hot pink shoes, and can we just talk about her chunky little legs? LOVE. Without a doubt, these are my favorites from Isa’s one-year birthday portraits. So much happy going on here! Isa’s beautiful mama gets to celebrate her 25th birthday just a few days before Isabella’s first! A huge thanks to Abbott’s Frozen Custard in downtown Greer for letting Isa smash her cake in their adorable restaurant! This little “sweet one” was so funny exploring her cake! Yep, she got over her hesitations and pretty much dove right in!! This picture just cracks me up. As always, you can “like” this post below to share on Facebook, scroll over any image to “Pin It” to Pinterest, and leave a comment below to show us some love! Thanks for checking out Isabella’s cake smash and birthday portraits! Snow in the South is such a rarity; when it comes, it isn’t “business as usual.” We slow down, hunker in, and live life a bit more intentionally. After Greenville South Carolina experienced a beautiful fluffy snowstorm in January, I couldn’t wait to photograph some magical children’s snow day photography sessions! Miss Ella Jane was excited to get dressed up and brave the cold to become a bit of a Snow Princess for the afternoon. We had so much fun twirling her beautiful dress through the snowy yard…and even her snowman pal Olaf got in on the portraits! Snow is magical…childhood is magical…and the golden sun beaming through the trees created a winter wonderland that, too, was filled with a bit of magic. I hope you will enjoy Ella Jane’s snowy portrait session. Introducing…Ella Jane in the Snow! This portrait is definitely one of my favorites of this sweet girl! And as sweet and happy as EJ is, she can also give the camera one heck of a sassy, serious model face too! Color or Black and White..which do you prefer? I couldn’t decide! As soon as I think I’ve picked a favorite, I change my mind again! And how cute are Ella Jane’s fuzzy American Girl Doll ear muffs?? Love the intensity of her eyes…paired with a hint of sweet freckles. Ella Jane’s portrait session was right before the Clemson National Championship game, so she had to include a Clemson photo in the session! In spite of goofy Olaf’s best efforts, this pretty snowstorm was powdery and wasn’t the greatest for building snowmen. Sorry, Olaf! I hope you’ve enjoyed the magic of this southern snow day portrait session! As always, it’s awesome when you leave a comment below to show us some love! You can also “like” this post to share it on your facebook page if you’d like. Today is baby Carter’s first birthday, so I wanted to celebrate him with a “throwback Thursday” post of his Christmas newborn portraits from last year in Greer SC. I have been a completely terrible blogger over the past year, and I have worked with so many amazing families whose love just shines through in their portraits. These special people deserve to be seen, so I’m hoping to get back on the blogging bandwagon in the coming months! Big brother Tanner welcomed Carter last Christmas, and Tanner is the most famous kiddo in downtown Greer! Tan-man helped introduce his baby brother to the local coffee-shop, all of the best festivals our little city has to offer, and made sure that he was always selfie-ready for social media. Tanner and Carter’s parents are integral players “here in Greer,” as the owners of several local businesses, including Events at the Davenport, Greer Event Rentals, and YourMark. I am obsessed with these gorgeous windows in Carter’s home, and I love this sweet moment with his Mommy and Daddy. I love sweet candid moments when families are all snuggled together at home. In-home newborn sessions means that no one has to bundle up baby and go out into the world before you are ready, and it also means that I can capture your sweet new baby in his or her first home. Tanner was so excited to help (re)decorate the tree while his baby brother ate and changed. This cross ornament was a super special one for him to show me. Brother feet are super sweet. <3 In no time at all, I bet these feeties will be the same size! Thank you, Stevens Family, for trusting me with these most special first portraits of your family of four. I hope that Carter’s first birthday and this Christmas are filled with magical moments! As always, friends, if you like what you see, please leave a comment below to show us some love! I think we can all agree that cancer is a terrible, scary, confusing thing. But the Masseys’ family portrait session at a farm in Greer SC wasn’t about cancer. Their portraits were about love, and hope, and overcoming, and faith, and family, and miracles, and making each day count. 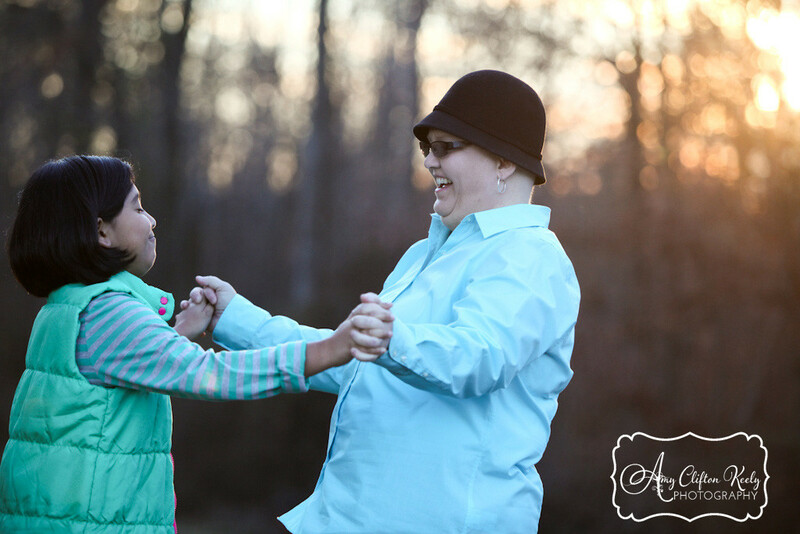 Their session was about having fun and loving on each other and leaving cancer behind for a while. It was about their “Massey Miracle,” which is still unfolding every day. It was about telling cancer to “Take THAT” and not letting it rob them of life. At the end of our portrait session, the whole family kept talking about how much fun they had. Among my prayers for healing, I also pray that during the tough days, these photos will remind Andrea, Randy, and Makenna that fun days DO still come. I originally planned to publish these photos on Sunday, February 1st, because the family has asked their community to come together and lift Andrea up in prayer, all on the same day. I know, however, that the family is in the midst of waiting today…for tests, for test results, for answers…so I thought that today might be an even better day to be reminded of the fun times. Blog readers, please pray for the “Massey’s Miracle.” Please pray today, and please join together on February 1st. Take that, cancer. The Masseys are strong!!! Andrea and I used to work on the same hall–she taught 4th grade and I was in charge of the after school program–and I remember the day she got the phone call that her beautiful Guatemalan daughter was born. What a special day! Makenna is beautiful, sweet, and FUNNY!! I just can’t decide…color or b&w?? Andrea, you are beautiful! Inside and out, this lady just radiates God’s love. Take THAT, cancer. Love always wins.